In North America, conversations about Brazil might center, depending upon one’s particular bent, on the beauty of the beaches and the jungles of the Amazon; the merits of the national cocktail, the Caipirinha and the bacchanal of Carnival; or the poverty in the big city favelas and environmental destruction caused by gold mining and logging. These images are all true of Brazil, but there is more. This is a very large nation that encompasses a teeming diversity, much of which is unknown outside its borders. Included among the treasures of Brazil is one of the liveliest contemporary documentary scenes in the Western Hemisphere. There is also a long, if not always consistent, tradition of documentary production in Brazil, that deserves further explanation elsewhere. For now, and for non-Brazilians, much of the credit for introducing the world to his country’s current documentary vigor goes to Amir Labaki, critic, government advisor, founder and director of “E Tudo Verdade”, the “It’s All True” documentary film festival. There have been recent individual international Brazilian triumphs, like BUS 174 by Jose Padilha and Marcos Prado, presented on US television by HBO/Cinemax and won the IDA ABCNews Video Award in 2003. The works of Eduardo Coutinho (EDIFICIO MASTER) and Walter Carvalho (JANELA DA ALMA) have also been seen widely in Europe if not North America, but “It’s All True, ”which celebrated its tenth year in late March/early April 2005, offers a broad panoply of the Brazilian documentary scene. With numerous venues, the festival is as sprawling as its home city, Sao Paulo. It also travels to Rio and to the capitol Brasilia, but its heart is found amid the muggy, traffic clogged streets and high rises of this, the world’s third largest city. A competitive festival, there are two juries, one international, the other for Brazilian productions. This year, 15 films competed for the international award; of them only one, BUSH’S BRAIN by Joseph Mealey and Michael Paradies Shoob was from the U.S. (Eugene Jarecki’s WHY WE FIGHT – also a U.S./E.U. co-production was the opening night film), and only one, the winner of the Brazilian Feature competition, ABOIO (CATTLE CALLERS) by Marllia Rocha was indigenous. The remainder of the International Competition films came from, quite logically, around the world. The International Jury, composed of England’s Brian Winston, Marina Goldovskaya from Los Angeles, and Brazilian Roberto Berliner awarded first prize to the Swedish film REHEARSALS (REPRTITONER) by Michal Leszczylowski. In it, playwright Lars NorEn writes and directs a play for and with prison inmates. The jury commendation stated: it is, “A thought-provoking and demanding film which looks at deep and serious issues about the value of education programmes in prison and the nature of European bigotry and nationalism.” The jury also awarded a special commendation prize to Sean MacAllister’s THE LIBERACE OF BAGHDAD, which has been a favorite at many recent festivals. Of the 130 films shown, 72 were Brazilian. Audiences in Sao Paulo turned out for the international competition, and other showcases, but their real enthusiasm was for the Brazilian work. Young Brazilians, in particular seem very excited by the documentaries emerging from their worlds, and they packed many of the screenings. One problem for non-Portuguese speakers was the lack of English subtitles on many of the films, but the most engrossing documentaries succeeded despite this. Typical such success was TROJAN HORSE OPERATION (OPERACAO CAVALO de TROIA) a short by Laura Faerman, Axel Weisz and Thiago Boas. The story of two suburban boys trying to crash a rave party was one of the “buzz” films. Even a local political feature, LUST OF POWER (VOCACAO do PODER) made its points, sometimes complex and parochial, without translation. In a modified verite style, it follows six first-time candidates, including a female evangelical and a Black rapper, running for city council in Rio. Fundamentalist Christianity wins-rap loses. As befits a ten-year anniversary, there was a retrospective of past festival winners, offering a chance to see highlights of recent Brazilian production. One of these was the short IN THE DOGHOUSE (CASA de CACHORRO) by Thiago Villas Boas. This charming film reveals much about the soul of Sao Paulo simply by showing life. Of the tens of thousands of homeless in the city, a few have turned to the manufacture of cheap lumber doghouses, which they nail together and sell in the underpass of a superhighway. Customers stop to dicker over the purchase price, and the people making them take great pride in their self-taught craft. An edict from City Hall dictates the demolition of the squatter’s industry, and the filmmakers capture their frustration and despair. Another section of “It’s All True” was devoted to the work of DOCTV, a national initiative to put documentaries on television. Entitled “The Program for Fomenting Production and Broadcasting of Brazilian Documentaries,” DOCTV is a co-project of the Ministry of Culture, TV Cultura, the Brazilian Association of Public, Educational and Cultural Broadcasting Companies, and is supported by the Brazilian Documentary Filmmakers Association. DOCTV has put on the air three series of films in 27 of Brazil’s states. There has also been a modest television documentary pitching market called “Brasil Documenta”–not connected to the festival—held for the past few years in Rio. Documentaries in Brazil, as in most of the world, find their largest audiences on television. The theatrical release of Brazilian films is not large, with the small number of cinemas being concentrated in only the major cities. However, the work of Adhemer Oliveira in creating an art-house chain of theaters, which can project digital work, has been important to recent growth. According to Labaki, prior to 1993 about 25-30 Brazilian documentaries were produced each year. By 2002, that number increased to nearly 400. Many of these do find their way into the few art theaters, where audiences and critics treat them as cinema on the same level as fiction films. Still, the best showcase for documentaries, old and new, Brazilian and foreign is “It’s All True.” It is named, of course for Orson Welles’ ill-fated Brazilian film so poignantly documented in Myron Meisel’s 1993 film of the same name. 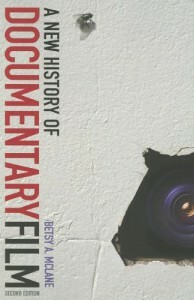 For the past five years, a serious academic conference on documentary has paralleled the festival. Organized by Professor Maria Dora G. Mourao of the Department of Cinema, Radio and Television of the University of Sao Paulo (who also cooks a mean version of feijoada-the Brazilian national dish), the conference has been attended by documentary academicians such as Michael Renov and Henry Breitrose as well as the top Brazilian film teachers. This year’s theme was ‘Direct Cinema and Cinema Verite: Trends and Devices of the Documentary in the Digital Age.’ There are several university-level film programs in Brazil, and the student turnout for the conference, and the festival was enthusiastic. This year festival goers were also treated to special screenings of Jean-Xavier de Lestrade’s THE STAIRCASE, the Spanish compilation MADRID 11th MARCH, WE WERE ALL ON THAT TRAIN, Goldovskaya’s THE PRINCE IS BACK, an homage to Fernando Birri, the founder of the International Film and TV School in Cuba, and the first Latin American retrospective of the work of cinema verite legend Robert Drew. Playfully titled “It’s All Drew”, the program pulled together the classics PRIMARY and CRISIS: BEHIND A PRESIDENTIAL COMMITMENT, along with rarely seen work such as YANKI NO! and STORM SIGNAL. None of the films had ever screened in Brazil, and the presence of Drew created a sensation of packed theaters and lively discussion. The retrospective also included his latest film, made with wife Anne Drew, the autobiographical TWO MEN AND A WAR.